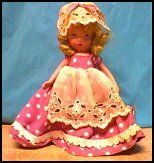 Nancy Ann Storybook dolls were produced by Nancy Ann Abbott in California in 1936. (That's even before my time, but not too much!). Actually, in the beginning, they were made overseas but the quality was poor. She started out making bisque dolls and then, in the 1940's, switched to hard plastic. There are Muffie's, and Debbie's and Lori Ann's in this series but I'm just concentrating on the Nancy Ann's. The bisque dolls have painted features and a mohair wig. The plastic dolls usually have sleep eyes. They range in size from 3 1/2" to 7 " and are identified on a wrist tag and/or a box and generally incised on the back. The boxes were usually white with either blue or pink dots. Today there are a lot of dolls that are in the wrong box and have no wrist tag. The Storybook Dolls had a lot of series, ie: Little Sister, Big Sister, Dolls of the Month, of the day, etc. Too many to mention here. The prices vary a lot for these dolls, depending on region and of course condition. But, as a guideline, a doll in good condition without a box or tag usually runs around $25.00 for the plastic and $35.00 for the bisque. In the box with the tag either the plastic or the bisque runs between $75.00 to $125.00. I've even seen them sell for higher. These are adorable dolls and would make a very nice addition to anyone's collection.